Three weeks after the Chris Brown and Rihanna infamous evening after the Pre-Grammy's, they were both spotted at Diddy's house in Miami. Rihanna was said to be chillin in the sun and where was our boy Chris spotted? He was raisin hell on a jet ski in Biscayne Bay, Miami. Not only was he ripping it up on the water and having a blast, he was sporting a rare 25 year Anniversary G-Shock and muscling it out on his ride. The ZShock Limited Edition Collection features the same Casio 25 year Anniversary G-Shock worn by Chris Brown, but taken to another level with a 14K solid gold bezel set with diamonds. Visit ZShock at www.ZShock.com and see why real ballers always have an iced out G-Shock in their collection of toys, just for the fun of it. Bow Wow tears it up on this freestyle, he mentiones his Diamond G-Shock and proceeds to display the talent of his flow. 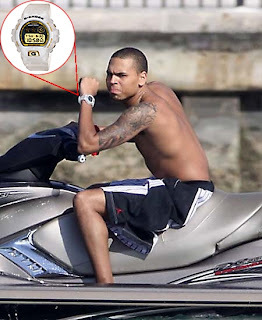 Bow Wow's G-Shock has a white strap with a blacked out bezel and black diamonds. The look is Hot, no doubt. The ZShock Centurion Collection has that hot black on black Stealth look. Get yours today and add an iced out G-Shock to your collection of toys, just for the fun of it. New ZShock video showcasing ZShock's newest iced out diamond G-Shock bezels called the Premier Series. Nothing less that stunning, if we do say so ourselves. Watch and see why any true baller has an iced out G-Shock (with a ZShock bezel) in his watch collection, just for the fun of it. ZShock's Premier Collection of Diamond bezles for Casio G-Shocks has arrived. The ZShock Premier Collection of bezels comes in a variety of stone and preciouis metal combinations and are designed to fit a myriad of colors of a particular G-Shock. ZShock's diamond studed versions of the G-Shock watches can be dressed up or dressed down. They will look fly with a nice pair of dress slacks and a jacket or look super fresh with a crisp tee and dark denims. Either way, you will be styling wearing an iced out G-Shock. ZShock does it agian by delivering another iced out diamond G-Shock for the streets. Check these fantastic watches out at www.ZShock.com.